We met with Katrina and Brian while ago to talk about their Camp Fircom wedding, which they were planning no short notice. Four months of planning to be exact. We learned a lot about them, from when they first met in Phoenix, all the way to their move to Vancouver. Above all we learned that Katrina and Brian are an adventurous couple: they hike, they camp, they've climbed, you name it! 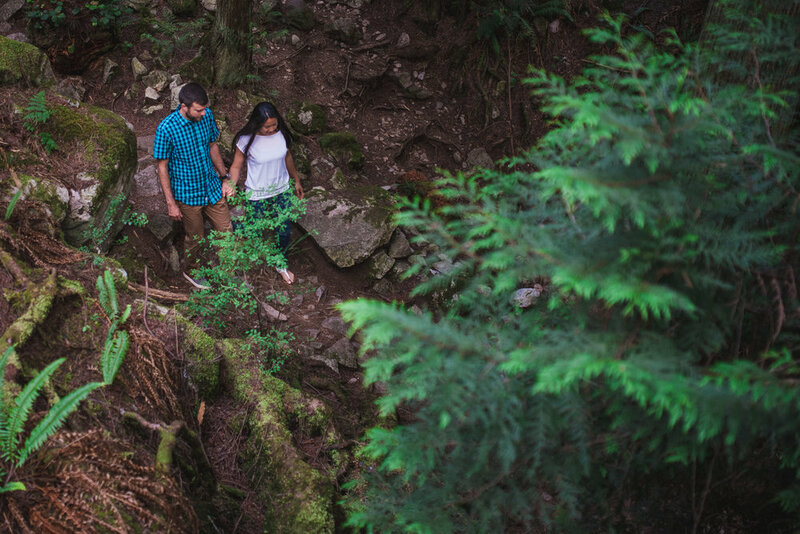 It only made sense to do a bit of hiking during their engagement session. They told us about a hike they enjoy around Light House Park, and we thought it would be perfect to go and walk it with them. As we made our way to the cliffs, waves crashed on the rocks, clouds danced in the sky and sun began its slow dip behind the mountains. We clicked away with our cameras as Katrina and Brian explored around many of the embankments, in the hunt for the perfect view. Thanks so much to Katrina and Brian, for the fun evening, and of course, your infectious smiles and laughter! We hope you love the photos! Check out more blogs here!